Hoping someone can point me in the right direction. I'm trying to learn how to setup, maintain and then record how-to videos all based on SharePoint 2010 using Windows Server 2012 R2. I'm doing this in my own home, so budget is next to nill. I'll be using trial versions of software but am confused about the actual starting points. Various articles already assume that many items are in place and don't give a lot of directions. I'm looking to build a SharePoint 2010 Sever with at least three users connected (admin and regular users). I need all the steps from what to install first and configure and so on. This is going on a completely blank PC so I need steps that include how to set up the Windows Server as well. You should be aware of the following points before you start. Configure Active Directory (you can install it on the same machine only for dev environment , but it's not supported on the production environment ). Make sure that you have an internet connection to can install prerequisites online by clicking on install software Prerequisites . 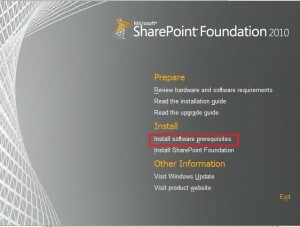 Now SharePoint should be installed successfully , If you have stopped at any step , tell us on comments. If you need to install and configure this machine for learning purpose , I suggest to you to start the full guide to install SharePoint 2010 with Windows Server 2008 R2 rather than Windows Server 2012. Not the answer you're looking for? Browse other questions tagged 2010 sharepoint-server development administration installation or ask your own question. can I install windows sharepoint service 3.0 in windows server 2012? Practical WSS 3.0 development environment? Strategy for correct external authentication? Production SharePoint 2013 environment with only one server? Does SharePoint come with Windows Server?